There are two revolutions currently taking place in the National’s refurbished and newly rechristened Dorfman Theatre (previously the Cottesloe). One is the peaceful People Power protest that ousted the Marcos regime in the Philippines in an astonishing four days in 1986. 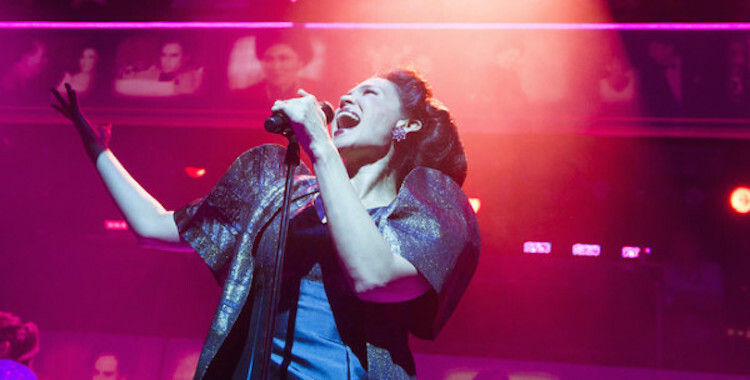 The other is a small revolution in mainstream musical form, as David Byrne and Fatboy Slim’s pounding, glitter-encrusted take on the life of Imelda Marcos puts audiences right at its pulsating heart. Or perhaps revolution is too strong. More accurately, what Here Lies Love does is marry elements of immersive performance and gig-as-theatre to the more usually conventional form of the musical. What that means as an audience member – unless you choose to hide away up in the circle – is being thrust under the disco ball and into the action. Inspired by Imelda’s taste for the New York nightlife, Alex Timbers’ staging and David Korins’ design transform the Dorfman into a club of sorts, in which the dramatic action happens not in front of us but around us. Taking place on stages, platforms and catwalks on all sides, the show breathlessly – and entirely in song – tells the story of Imelda’s rise and fall. We first see her as a simple country girl, singing dreamily about love, but within the swirl of a skirt she is winning beauty contests and setting her sights on Manila, where she meets and quickly weds rising political star Ferdinand Marcos. The whole thing is swift and relentless, its soundtrack beating out plot point after plot point in a series of murderously catchy songs. There’s no time for the attention to waver, let alone to reflect. This is a noisy, glittering juggernaut of a musical, pausing for no one. As a result, anyone hoping for political insight or analysis of the Marcos era will inevitably be disappointed. The creative team do an impressive job of speedy storytelling, but the rhythm of the show doesn’t allow for the more intricate nuances of power and influence. There are plenty of unanswered questions, both about the Marcoses themselves and the people they ruled. Poverty, corruption and the tangled international threads woven between the Philippines, the US and a number of dubious world leaders all get mentions and little more. But neither is Here Lies Love built for this kind of political complexity. This is a show about the excitement and intoxication of power rather than about its particular mechanisms. And in this it undoubtedly succeeds, sweeping us up in its heady, irresistible outpouring of booty-shaking joy. It’s loud, brash and occasionally downright ludicrous, but no less giddily enjoyable for any of its flaws. Participation is key here. (For me, as it turned out, more participation than I’d bargained for.) Part of what makes Here Lies Love so intensely, well, loveable is the experience of moving and dancing with it, helplessly seduced by the glamour and the music. Like the initially adoring public of the Philippines and the leaders all over the globe who fell in love with this Asian answer to the Kennedys, we are utterly taken in, before our involvement later takes on a more uncomfortable and complicit edge. There’s a clear parallel too between the allure of a glamorous leader and the adoration heaped on the stars of stage and screen. In the lead role, Natalie Mendoza lightly plays with this analogy, making it easy to imagine how she might inspire such hysterical levels of devotion. Much more than a charismatic stage presence and an impressive set of lungs, Mendoza also visibly toughens as the show lurches forward, transforming from the soft Rose of Tacloban to a diamond-hard politician. In her steely gaze and stiff, proud shoulders, we can begin to understand some of Imelda’s motivations. Perhaps appropriately, however, the woman at the centre of Here Lies Loveremains somewhat elusive. This is not really about offering a new perspective on Imelda’s experience; this is about shining, seductive symbols of power more than it is about those powerful individuals themselves. Instead of seeing Imelda, we see the outfits, the smile, the endless glamour and extravagance, the continued pretence – or maybe a persistent self-delusion – that everything is done out of love. The show’s strapline declares “power to the party” and that’s exactly it. Here Lies Love invites us all to the sparkling, exhilarating, superficial party of the Marcoses rule, and guiltily we – like Imelda – don’t want the party to stop.